In my (off-blog) recounting of my trip to the USA in February, I told you about a bittersweet encounter with my paternal grandfather, who I call Zadie (Yiddish for “Grandpa”). He died yesterday morning in his nursing home at the age of 90, and I want to tell you some more about him. His name was Alvin (Al) Shames–Avraham ben Yacov Yitzchak v’Dina. He was born in Denver, Colorado, the only boy among three sisters. He didn’t tell me much about his childhood, but I know that his mother died when he was eight, and his father was away a lot, so he was basically raised by his two older sisters. Zadie’s family was traditionally Jewish, if not very observant. He studied engineering at the Colorado School of Mines not far from Denver, and got his Master’s at Penn State. My Bubbie tells that her mother had a cousin living in Denver who was sick, and though my Bubbie’s family was very poor, her mother sent money to support this cousin. The cousin said that one day she would repay my great-grandmother’s kindness. Years later, when she had regained her health, she saw a young neighbor–Al Shames–waiting at the bus stop and asked him where he was going. He told her he was moving to Columbus to start his first job at Battelle Institute, and the cousin said, “Oh, I have family there!” (Just in case you thought “Jewish geography” is only a recent popular sport. 😉 ) She gave Zadie the contact information for Bubbie’s family, and when he arrived in Columbus, he gave them a call. Bubbie is the one who answered the phone and invited him to drop by. I am blessed to be the granddaughter of two sets of couples whose lifelong romance is the stuff of legend. They celebrated their 66th wedding anniversary this June. They look awfully serious in that photo, but they were a hilarious couple. He teased her constantly. 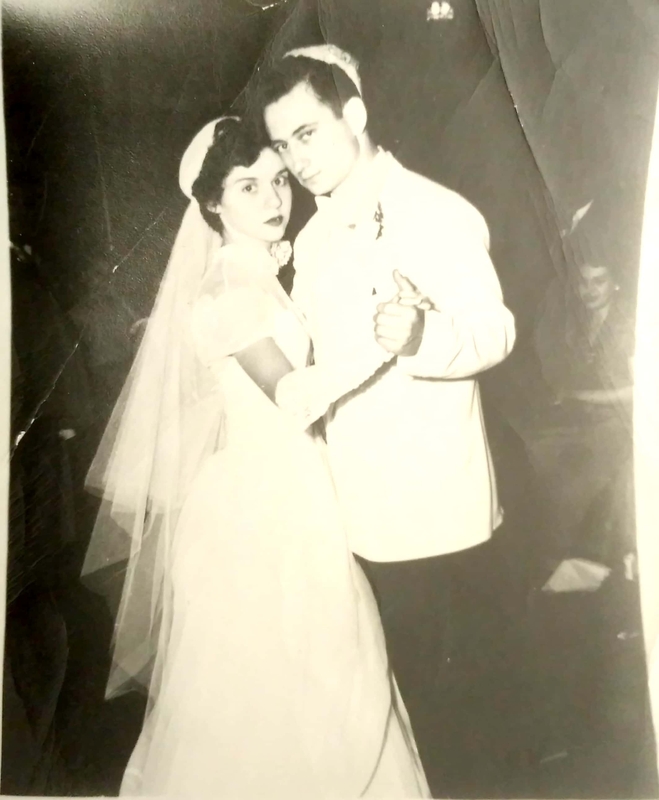 (If you ever wondered where I got my mischievous streak…) On one occasion when they were still dating, he disappeared for a while, and when he finally showed up again my Bubbie asked where he’d been; he told her he’d been in jail, and she believed him! Another time, after they were dating for a while and it was clear where things were going, he took her out to go dancing, and on the way to the bus stop, he told her that he had a gift for her. He took out a jewelry box… and inside it was a watch. She thanked him and put it on, and they kept walking. A few minutes later, he said, “I have something else for you…” and handed her an engagement ring. Bubbie and Zadie raised four children–a girl and three boys, of whom my father is the second-to-youngest–in Columbus, surrounded by cousins, uncles, and aunts. They always dreamed of moving to Israel, and when my dad was 9 or 10, they got on a boat and sailed across the sea to live in Hertzliya. Unfortunately, life here was very hard on them, especially the distance from family, and after three years, they returned to Columbus. In the time they were here, however, Zadie was an engineer for the Israel Aircraft Industries and was involved in the development of the Kfir. When my dad was a teenager, Bubbie and Zadie decided to send him to a religious Jewish high school in Cleveland. I recently found a letter Zadie wrote to him during that time tucked among old photographs. He wrote that it was very hard for him to send my dad away to a boarding school at such a young age, but that he was confident that it was the only way my dad would have a good Jewish education. 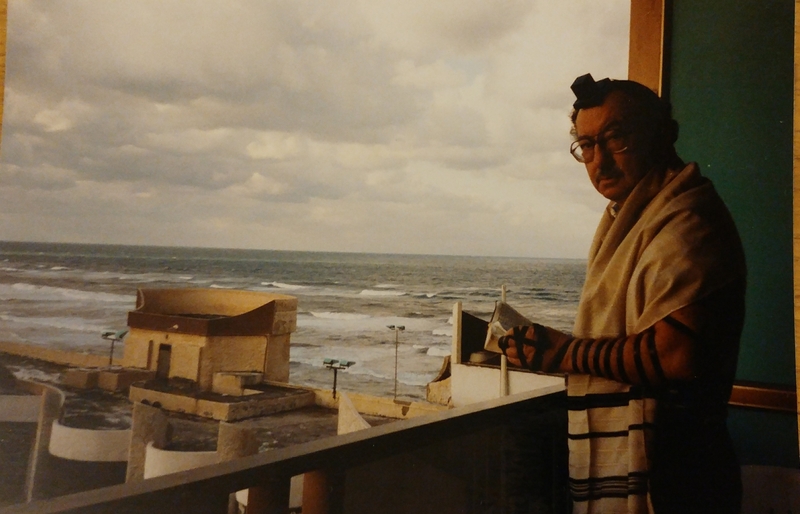 My dad’s experience at the school was difficult socially, but he did absorb a great deal of knowledge and fondness for Judaism, and became religious, starting to observe kashrut and Shabbat strictly. Bubbie and Zadie followed his example and started observing kashrut and Shabbat, too. Right after my dad graduated high school, they moved to Long Island, New York. My dad went off to medical school at Boston University, where my parents met, married, and had my older sister. Then they moved down to Long Island for my dad’s residency–and that’s where I was born. They missed Israel dearly and visited it all the time, especially after we made aliyah. Zadie loved everything about Israel: the people, the language, the food, the sunshine, and of course, the sense of being at home. He would take great delight in visiting the shuk, the open-air market in Rehovot or Jerusalem, sampling succulent summer fruits and Middle Eastern pastries. I’m pretty sure he was the one who first made an acquaintance with Gloria Mound of Casa Shalom (who, as I’m sure you recall, passed away herself earlier this year). I believe he took an interest in crypto-Judaism and conversos even before I did. He was an honored and well-loved member of his community in Long Island, serving for a while as president of the local synagogue. I have vivid memories of that synagogue–the scent of his cologne lingering in the wool of his tallit, mingling with the smell of wood varnish from the benches and old leatherbound books. He and Bubbie were also very active in Jewish and Israeli philanthropic organizations like the UJA, Hadassah, Yad Sara and Yad L’Kashish, contributing and volunteering. Judaism, the Jewish people, and the land of Israel were deeply, deeply important to him. He began to suffer from dementia and other health issues several years ago, and was in a slow decline from that point forward. He and Bubbie had to move to Florida to an assisted care facility close to where my uncles live, and last year he was moved to a nursing home. The separation was very hard on my Bubbie. They’d been living together for almost 65 years. I wrote this poem shortly after my last visit with him in February. I had never seen him cry before. When she squawked her protest. And walking to the bank. Except the memory of love. To make sure I know. “I always loved you,” he chokes. I fill the silence with stories about Seder nights and succah decorations. He listens with glistening eyes. “My little girl,” he murmurs. “You were special,” he says. We bask in the Florida sunshine. “Are you happy?” he asks. And I think I mean it. I don’t want to remember him like this. And holding comfy contests at bedtime. I don’t think I really understood the depth or power of his love for me until almost everything else was gone. I realized then that that love is something that has nurtured me since before I can remember, and will continue to sustain me for as long as I live. Jews say of the deceased, zikhrono l’vrakha, “may his memory be a blessing”; his memory is one of the greatest blessings of my life. So beautiful! Thank you for sharing, not just the memories, but the depths beneath them. Sorry for your loss, and wishing you a long life. I also lost my Grandfather recently, and had his funeral yesterday. He was a holocaust survivor from Vienna, who moved to Australia and became a doctor. He also ended up in a nursing home, but I’m trying hard not to remember him that way. Sharing stories with family, anecdotes from his life, has just been wonderful. 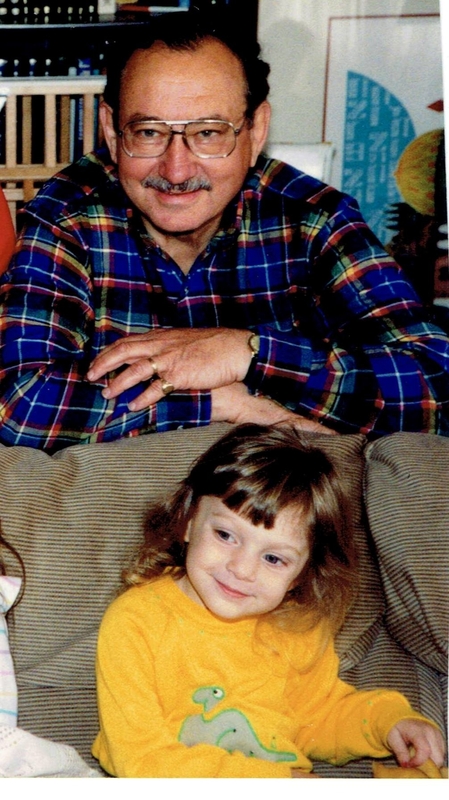 I hope you can remember the good times with your Grandfather, and the lessons he taught you. Zikhrino l’vrakha. Sorry for your loss as well. Sounds like your grandfather had many amazing stories. May God comfort us all among the mourners of Zion and Jerusalem. Just revisited this. Very bittersweet. Never miss a post! Sign up below to get them straight to your Inbox. Diversity of Language: A Biblical Punishment? Jordi on Happy Birthday, Josep! Daniella on Happy Birthday, Josep!